Jimmy Toscano was smart, talented, and the rock in his family. When he was drafted to serve in the Vietnam War at age twenty-two, he willingly accepted the request from Uncle Sam. After all, Jimmy, who was always up for a challenge, was full of life, drive, and a determination to make the world a better place. 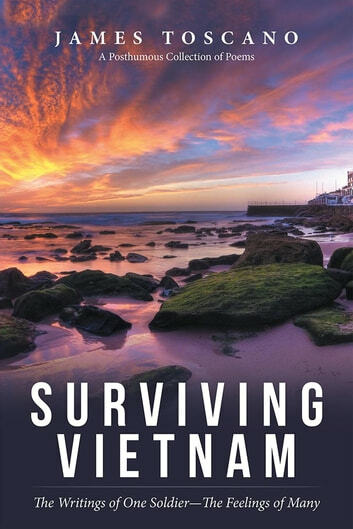 In a posthumous collection of poems, Jimmy leads others down a lyrical path through the experiences he endured during the Vietnam War as he fought alongside over two million other soldiers, and after as he returned to an unwelcoming America. Jimmys poems shine a light on the effects war has on a soldiers family, what it is like to stare death in the face, the brutality of combat, how the war transformed energetic young men into broken souls, and the challenges that accompanied their return home as they learned to battle a new enemy: the haunting memories of war. 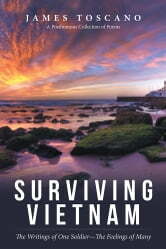 Surviving Vietnam shares poignant and candid poems from a war veteran that expose the realities of the battlefield and beyond.